Tomatoes and Basil in a jam? It isn’t just for bruschetta and pasta sauce. This luscious duo is outstanding as a jam on toast, perfect slathered on a bagel, even better when dolloped on top of cream cheese on crackers…. Seed, core and finely chop tomatoes. Measure 3 ½ cups chopped tomatoes; place in a 6 to 8 quart stainless steel, enamel or nonstick heavy pot. Bring to boiling, stirring occasionally; reduce heat. Simmer, covered, for about 10 minutes, stirring often. Measure 3 1/3 cups tomatoes and return to pot, stir in lemon juice and basil. In a small bowl, combine ¼ cup of the sugar with the fruit pectin; stir into the tomato mixture. Bring to a full, rolling boil, stirring constantly. Stir in the remaining 2 ¾ cups sugar. Return to a full rolling boil, stirring constantly. Boil hard for 1 minute, stirring constantly. Remove from heat, quickly skim off foam with a metal spoon. 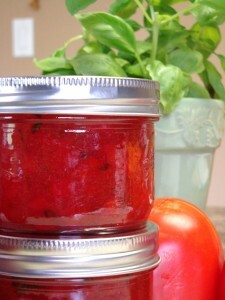 Ladle into hot, sterilized half-pint canning jars leaving a ¼ head space. Wipe jar rims; adjust lids and screw bands down fingertip tight. Process filled jars in a boiling water canner for 5 minutes (start timing when water returns to a boil). Remove jars from canner and cool on wire racks. Let sit at room temp for 24 hours to set. Makes 5 half-pint jars. * Certo makes this product and it is available in a blue-coloured box, do NOT use regular powdered pectin as the mixture will not set.